Helps for Worship #1: What Is Worship? Martin Luther died within eyeshot of the font where he was baptized as an infant. During his life, he had come to see the entire Western world change. 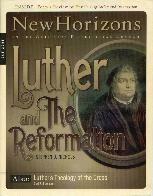 Born on November 10, 1483, Luther entered a world dominated by the Roman Catholic Church. By the time of his death, that institution was crumbling. That was due in no small part to the lawyer turned monk turned reformer. Luther pried open the lock that the Roman Catholic Church had on worship, the sacraments, religious life, and especially the gospel. He pointed the church back to its sure foundation of God's word and the gospel, laying the foundation for the Protestant Reformation that would encompass Ulrich Zwingli's efforts in Zurich, John Calvin's in Geneva, and John Knox's in Scotland. By 1560, after much political and religious strife, the Protestant faith in its Reformed expression had achieved commanding influence in Scotland, under the leadership of John Knox. Prior to Knox, however, several Protestants, some of a Lutheran persuasion, were laying the foundation for the Reformation in their homeland.